What are the Characteristics of a High Performance Team? How can a Leader develop such a High Performance Team? This 2-day workshop incorporates the knowledge, skills and attitude required for Managers to become High Performing Leaders. In the VUCA (Volatile, Uncertain, Complex, Ambiguous) world that we operate in, it is essential to have High Performing Leaders who have the right mindset and attitude to navigate challenges and capabilities to lead their teams to great heights. Leadership entails more than just putting in place systems and processes and managing people by rules and policies. High Performing Leaders have the ability to develop, motivate and empower others around them to achieve great outcomes for the organisation. This programme incorporates the knowledge, skills and attitude required for Managers to become High Performing Leaders. This course is designed to equip Managers and Team Leaders with the knowledge, skills and attitude to be High Performing Leaders in order to achieve organisational goals as well as develop their teams’ potential and capabilities. 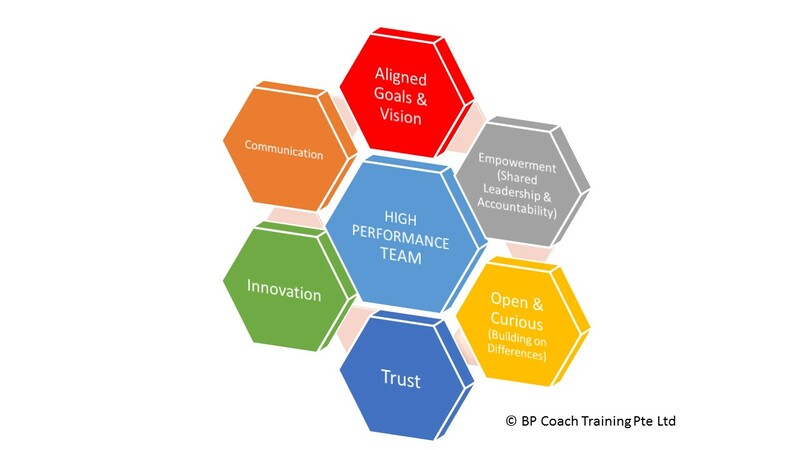 The 6 characteristics of a High Performance Team are shown in the diagram below.